The first unfortunate thing that pops up is that the group that put together the report recommends against treating broadband like the utility it is, yet it also rightly calls it “infrastructure”. Despite broadband being more-or-less unregulated as it is and leading to no competitive choice for 25Mbps+ for 55% of Americans, they state flatly that regulation “would be costly and could result in undesired impacts including constraining industry growth”. This strikes an immediate poor response for the many Utahns who, even in urbanized areas of Salt Lake City, cannot purchase wired service that meets the legal definition of broadband. Not Just Copper: Is CenturyLink slowly withdrawing from the residential wireline market entirely? Almost all of our broadband heartburn comes from uncompetitive markets. Even in areas with at least two wireline competitors (which is only about 95% of the urbanized Wasatch Front), you’re usually stuck picking between faster speeds from Comcast and cheaper speeds from CenturyLink. I’ve already written that it’s looking like CenturyLink is going to let copper die without a replacement, but it’s entirely possible they just want to get out of the residential market entirely. This would be a nightmare for competitive choice in our state. Do you remember the last time CenturyLink upgraded their ADSL2+ product? I do; it was 2009. The year before, they stopped doing FTTN deployments entirely, occasionally lighting a new FTTN node here or there. Most of the Wasatch Front is still limited to 7Mbps ADSL with real-world performance usually coming in much less than that. I know people in Sandy that struggle to squeeze 3Mbps out of that aging copper. It makes CenturyLink’s claims of doing their own gigabit fiber seem pretty hollow and underscores that their main purpose in deploying FTTN may have been to try clubbing competitors in the kneecaps. Just look at how CenturyLink has been not responding to competitive threats. In Provo, Comcast very quickly pushed their system to its absolute limits with a 250Mbps/50Mbps tier that price-matches Google. What did CenturyLink do? Nothing. They haven’t uttered a single word about doing any kind of upgrades in Provo at all. Who can blame them? It would cost them tens of millions of dollars to go after a customer base that hates them. The ROI would be so far out as to be disastrous. It’s noteworthy that the only places CenturyLink has announced doing FTTH have been duopoly markets, places with a more-or-less captive customer base. Given their non-response to Veracity rolling their own ADSL2+ using CenturyLink cabinets, this isn’t too surprising. At the same time, CenturyLink has been chasing down deals to build fiber to cell towers and focusing heavily on their business services through acquisitions like Savvis. These premium services command much greater profit margins and more stable user bases than residential markets, plus they can easily convince businesses to pay the full cost of installing the latest technology. Even when the fiber to cell towers goes into residential areas, CenturyLink has been noncommittal about using it to upgrade DSL users to better speeds or technologies. It seems very strange to not want to use the investment to upgrade other services. I’d usually say they just don’t have the money, but they just approved spending $1B on a stock buyback program, money that would deploy gigabit fiber to as many as 1M homes and businesses. This all paints a very disturbing picture for the future of telecommunications where open access systems like UTOPIA aren’t or won’t be available: Comcast will be the only real ISP for most users, and cities who go with Google Fiber will be right back into the “fast vs cheap” duopoly they hate so much right now. This is one of the many reasons why I’ve been so sour on both Provo and Salt Lake City for going with Google instead of fixing the underlying anticompetitive problems in the telecommunications space. Why would you expect Google to be any better than Comcast when they no longer really have to work for your business? 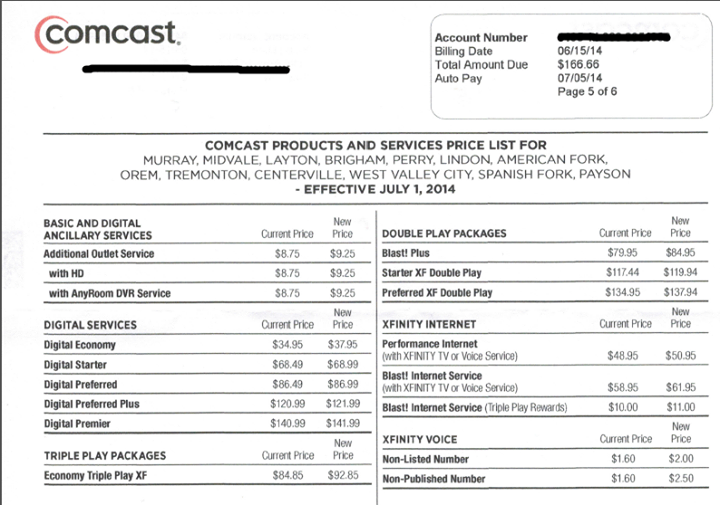 Competition is good, and Comcast is just now proving it. I spoke with one of their sales guys who confirmed that Comcast will be offering a package of 250Mbps/50Mbps for $70 starting in September, but only in Provo. (Sorry, everywhere else.) This is in direct response to Google Fiber coming to town and will include a new modem with a built-in 802.11ac router to take advantage of the speed bump. It’s unknown if this speed tier will land in any other cities in the future. This is yet another story proving that having a fiber network in your town benefits everyone, not just subscribers. Can US Ignite Succeed Where Other Efforts Have Failed? Last Thursday, The White House announced the launch of US Ignite, a new initiative whose goal is to spur better broadband and applications to take advantage of it. It brings in some heavy players including UTOPIA and UEN from our own state, incumbents like AT&T, Verizon, and Comcast, and tech giants like Mozilla, Cisco, and Juniper. I know I should get excited about something like this, but the best I can muster up is ambivalence. In many cases, a consortium will often fall victim to the selfish interests of individual members. Many of us will remember how Rambus joined JEDEC, seeded the standards with their patent-encumbered technologies, and then went on a spree of lawsuits demanding royalties and licensing fees for using the standards they helped create. Despite eventually losing most of the suits and having a number of their patents invalidated, they pulled an entire technology industry into courtrooms for well over a decade. Most of the players in US Ignite have significant patent portfolios, and make no mistake that many of them participate in standards bodies not because it’s for our own good, but because there’s a buck to be made. Another problem is that US Ignite has an all-too-standard “big on vision, light on specifics” mission statement. Granted, there are some good ideas in there. Dynamically switching VLANs can open up a bunch of possibilities for service providers. Gigabit and beyond connections are pretty much required for doing any kind of serious heavy lifting. Locally provisioned virtualized computing resources are pretty slick. All of these are really important and good ideas, but they feel more evolutionary than revolutionary. And then there’s the elephant in the room that nobody really wants to talk about: why don’t we already have these networks in more places? US Ignite seems to assume that the problem is that we don’t have applications to drive demand from end users, so that’s why the networks don’t get built. That, unfortunately, turns the actual problem on its head. Because of the severe lack of competition in the telecommunications space (which is only getting worse as telcos fail to upgrade), networks have no incentive to build those next-generation networks because what they offer now is cheap to build and just good enough to stay marginally competitive with the only other option in town. With the heavy involvement of incumbent operators and their vendors, you’re unlikely to see the barrier of an anti-competitive market get addressed. I wish US Ignite all the best and hope that they can come up with something useful. That said, I’m kind of resigned to the idea that after the initial fanfare, they’ll fizzle out a die quietly in the corner. For a very long time, detractors of UTOPIA have pointed to the wireless market as a shining example of how the private sector provides superior competitive choice and great consumer benefit. Now we’re watching as that example starts to look a whole lot like the wireline business, locked up in relatively few choices with little product differentiation between them. Once AT&T completes its purchase of T-Mobile (and nobody seriously expects the deal to fall through), two companies will control over 65% of wireless lines in the United States, both of which are nasty players in the wireline duopoly business. This is just the beginning. Today, it was announced that AT&T plans to buy up T-Mobile for a cool $39B. This would combine both nationwide GSM providers into the single largest wireless company in the country and bump us down to three such companies. A lot of fiber naysayers like to point to wireless as an example of robust telecommunications competition in the country, but, ignoring the wide gulf of differences between wireless and wireline telecommunications, how can we have a competitive market with just three nationwide carriers? I’d argue that we can’t. Sprint will continue to be a bit player in the space since they don’t have much in the way of wireline assets and Clear is a boat anchor around their neck. Smaller and largely regional cell providers like Cricket and US Cellular don’t get the hot devices people want and often get chained down in pre-paid pricing plans. The MVNOs live and die by the terms set by larger carriers. The big companies sit on a mountain of unused spectrum which prevents new entrants to the market from even taking hold. In short, we’re witnessing the wireless space do the exact same things that make us hate the wireline space. This merger will mean higher prices, less consumer choice, and more regulatory capture than ever. Sadly, I expect the same thing to happen that always does when a bad deal is put before the regulators: the state PUCs and PSCs will hand-wring and sign off on what they know is a bad deal using conditions that they know either won’t be met or would have been anyway, and the FCC will just rubber-stamp the decision with minimal oversight or review. And the whole time, we’ll be told that it’s a good deal for consumers. Incumbent telcos haven’t exactly been thrilled at having to offer their lines at wholesale rates to competing ISPs, especially since landline revenues have been sliding into a ditch. While AT&T and Verizon can keep most of that revenue with a wireless division, Qwest has no such option and has struggled with making enough money to either reduce its staggering debt load or upgrade its network. Instead of offering, say, good service or a product that people want to buy, they instead figured out that rolling out FTTN would let them claim to no longer have a copper plant to share. Of course, they don’t admit so much in public, instead insisting that other ISPs are just too incompetent (heh) to handle their shiny new pipes. Well, Xmission has called them on it with a recording of a Qwest agent saying flat-out that the point of FTTN has been to eliminate competition and bring all of those customers in-house. It’s pretty damning evidence that Qwest doesn’t want to compete based on the products and services they offer, but rather on locking out competition. Is it any wonder that we have fewer ISPs today than we did in 1997 and that the few remaining ones are on UTOPIA as a means of survival?